Since my very first employee many years ago, I have been teaching and or sharing my knowledge, love, and passion for floral design. I am constantly asked via email, twitter, and facebook, how I do, what I do. I willingly and happily answer these requests because I believe in the beauty of helping others. My business continues to grow and develop because I have been guided by other designers that are operating bigger businesses than mine. I am always reaching a little higher and looking to someone else for guidance and or inspiration. Those business owners who have willingly helped me or taught me, are also the reason why I help others. It is important to share resources, and technique with others in your trade. Its like a huge support group. One of the greatest things I have discovered, is that many of us are searching for answers to the same questions. Just realizing that other designers need help or guidance took away a lot of my stress. As a business owner I felt like I should know the answers to everything. Realizing that we all need some help and guidance at times was very freeing. Weeks ago I twittered "hey floral designers, who wants to meet me in NYC?" much to my surprise quite a few designers responded with an affirmative yes. Knowing I had friends in high places I went to the amazing and awesome David Beahm and asked if he would host our group for a design class. Being the incredible person that he is, he agreed to teach a design class and I get to help. Our little group is now up to 20 people traveling to NYC, 16 students in total, some Holly Chapple employees, and a photographer. In addition we will be shopping the NYC flower market, I have obtained a discount for the Chapel Designers at one of the major supply stores, we have a tour scheduled with Ovando, and many of us will be able to go to a taping of Martha Stewart, this trip is turning out to be truly incredible. It is clear that this trip is much needed, not only now, but in the future. Last Wens. just before I left for Texas we named our group, Chapel Designers. 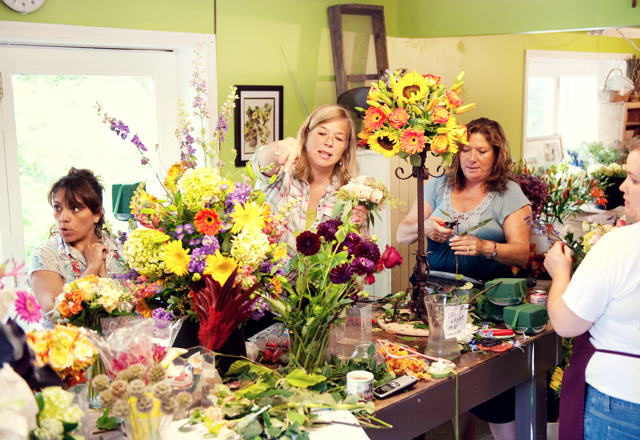 We now have a name for our group of floral designers that cater to the wedding industry. I bought the URL, got my twitter code and, Chapel Designers is now for real. I hope that this trip to NYC is the start of many adventures to come for the Chapel Designers. I can’t wait to meet everyone and learn a few tricks. Get ready for a multitude of questions from me! Looking forward to meeting you in person. what you organise is great Holly, congratulation to show people floral design is a truly art! I sure wish I could come too! Perhaps next year– I hope! I can’t wait to see photos from the trip!